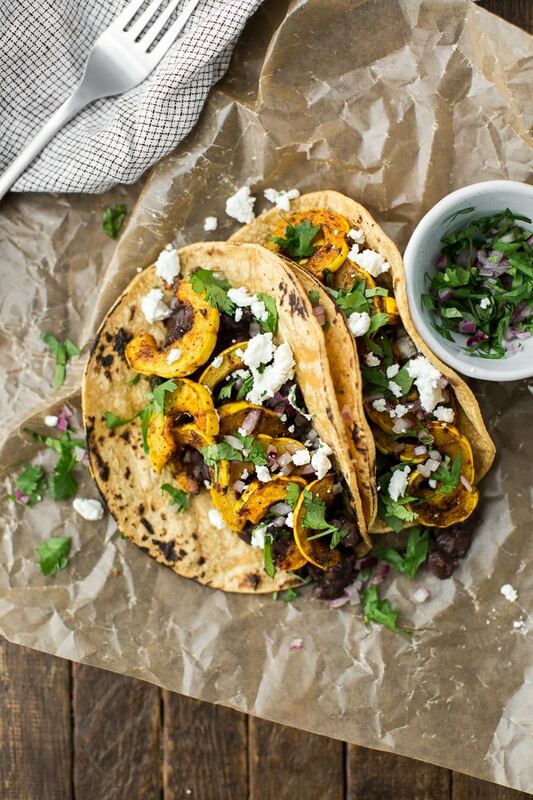 Delicata Squash Tacos with Black Beans | Naturally. Since Mack was born, M and I talk a lot about where we see ourselves settling down for the long haul. We’ve made it a goal to hopefully decide by the time Mack is in first grade, which gives us some time. I’ve always had my heart set on Colorado. The Rockies have always felt like my mountains, it feels like home. It sounds funny to say, I love the Sierras, but they don’t have the same feel. Before recently, I’ve always felt like Northern California is another stop on our journey and while that very well may be true, it’s starting to feel more and more like home. There’s a solid community here and I’ve met some amazing people. One of those people (Emma!) came to my house a couple weeks back just to hang out and cook. She brought produce and (very much needed) adult conversation. She hung out while I made these sweet potatoes and then we made tacos (because if given the option, I’ll always make tacos). 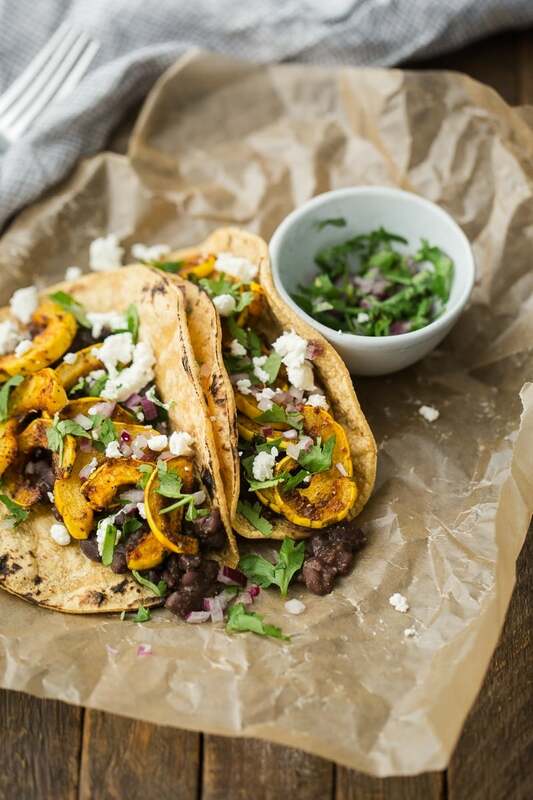 These squash tacos are a slight variation on the ones we made that day because I’ve come to realize, delicata may me the best squash for tacos. 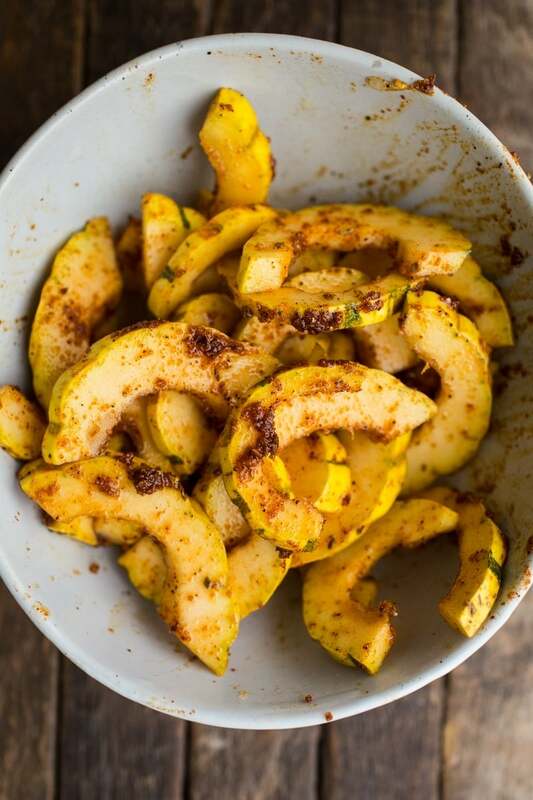 You might be thinking why delicata squash? Delicata is one of those hard winter squashes that doesn’t need peeling- you can eat the entire squash, skin and all. Sliced thin, like in these tacos, it roasts quickly, adapts to flavors you pair with it, and works for a myriad of meals. I also love delicata because one squash can easily translate into one meal (a butternut squash and feel a bit unwieldy.) 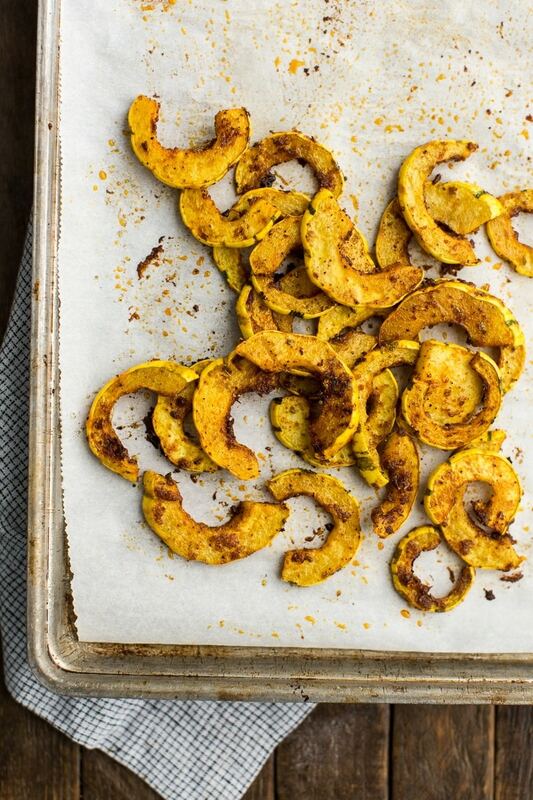 If you’ve never cooked up a delicata squash, roasting is a great way to start. Change up the seasoning: When I first made these tacos with Emma, we used a pinch of chipotle seasoning in place of the adobo. They were a bit on the spicy side but really good. Add some greens: Also the first time we made them, we dressed some spouts in a lime vinaigrette and added those to the tacos. I was out of sprout and traditional greens felt too heavy. However, you could easily add a lettuce or spinach base. Ditch the tacos: I love tacos, so it kind of hurts to say this but, the roasted squash works really well as a salad or gain bowl topper. If you’re looking to take the squash for lunch, I’d go this route. Preheat oven to 400˚. Cut the delicata squash in half lengthwise. Scoop out the seeds and place cut side down. Slice eat half into 1/4″ thick half moon slices. Place in a bowl, dizzle with olive oil and toss with adobo seasoning until well coated. Spread out onto a sheet tray covered with parchment paper and roast until tender and browning, 15 to 20 minutes. While the squash is roasting, combine black beans with liquid, lemon juice, and spices in a small pot. Heat over medium-low and let cook until the majority of liquid is gone. Turn off heat and let sit until ready to assemble tacos. Assemble tacos with a spoonful of black beans and top with a few pieces of squash, a bit of crumbled goat cheese, and a sprinkle of cilantro/red onion. + I use to warm tortillas in a damp towel in the oven but at this point in time, I place them over a direct flame on my gas stove. It softens the tortilla and creates a nice char. Just make sure to watch them, the tortillas can catch fire pretty easily. I can’t believe I’m admitting this but I have never made tacos. I love delicata squash so this is my kind of taco. in my opinion, delicate squash is the best squash. i can’t believe i’ve never used it in tacos. These look delicious! The colour and texture looks fantastic. Oh wow yummy that looks absolutely fantastic! I love the idea of smoky roasted squash with goat cheese and all the fixings. Sometimes the toppings are even better than the taco fillings! 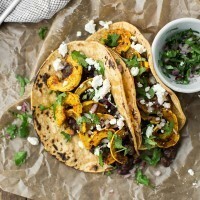 Roasted squash in a taco, great idea, I love the combination with goat cheese it sounds delicious and healthy at the same time. It’s a perfect week-night dinner. Trying to find home is difficult and nebulous- and sometimes it just completely sneaks up on you and shouts “surprise”! But tacos always help wherever you are feel like home. Always. Delicata squash is my favorite! Yeah… mostly because it doesn’t need to be peeled and doesn’t take long to roast, haha. Putting it in tacos is brilliant – this will have to happen in my life soon! This was great, thanks for the recipe! I used chipotle powder instead of adobo, and the squash came out a little too spicy (note for next time). For these tacos we made our own tortillas, using the recipe in your cookbook and referring to the video you posted about how to form them. As it was a first effort, we forgave the ugliness (last one was the best) but the taste of every one was so much better than store-bought! That star review thing wouldn’t let me pick 5 stars! Grr! Technology! I made this with acorn squash and grilled on bbq. That adobo seasoning is amazing! Also grilled the shells on bbq. Solid recipie. Thanks. I am always looking to introduce new opportunities to cook vegetables in familiar looking food in my plant based class for urban high school students. Delicata is so versatile, I was anxious to try these tacos. While the pictures look delicious, I actually made the tacos following the recipe and was very disappointed. Not sure if my adobo seasoning is heavy on the salt side but 1 tablespoon made the squash inedible. The beans had no flavor and turned to mush. The goat cheese overpowered. I like the idea, but back to the drawing board for me on details. I’m sorry to hear this recipe didn’t work- the adobo seasoning I make doesn’t have an overload of salt but I could see if you use a pre-made blend, this could be the case. 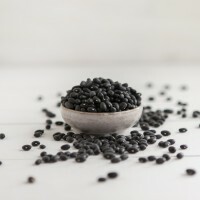 I’m also a bit surprised about the beans- this is my go-to bean recipe that I make every week, wish I had a better suggestion! Just a quick question: I”m assuming you don’t rinse the black beans ? How much liquid? I didn’t and I usually use enough liquid to cover the black beans (if there’s that much) in a measuring cup. However, more liquid will result in a mushier texture so if you want your beans to have more texture, use less water and cook for a bit less time.